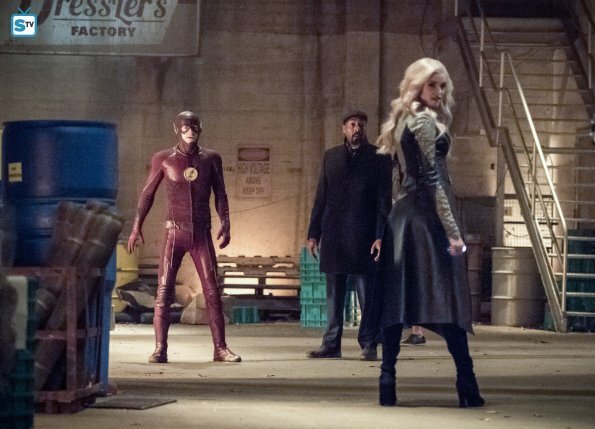 Team Flash tracks down Tracy Brand, the scientist who will one day discover a way to trap Savitar in the speed force, and tries to convince her to help. But Killer Frost is also looking for Tracy... to kill her. Meanwhile, Joe decides to tell Cecil the truth about everything. Oh, Cisco. He's been having a rough time, and I feel so bad. He refuses to use his powers to stop Killer Frost because he's so worried about hurting Caitlin. I love their strong, and platonic, friendship, but someone else needs to give Cisco a hug when she's not around. Poor baby. It was hard to watch him so upset. Overall, this episode was an emotional roller coaster. Between Cisco and Julian worrying about Caitlin, Joe and Cecil hitting a new level in their relationship, and Barry learning the true identity of Savitar, this episode was overwhelming. It was a lot to take in, and my fangirl feels can't handle it all. I'm relieved that Joe finally told Cecil the truth--about Barry, Wally, everything--and he didn't just push her away to protect her. The whole scene where he apologizes and explains his dishonesty is important and memorable. It's a good example of a healthy relationship on TV, which I'm grateful for. I'm also glad they can move forward in their relationship because I like Cecil, and Joe definitely deserves to be happy. Again, I want Caitlin back, but Killer Frost rocked this episode. Her super powers are expanding, and it's awesome. (Like Frozone level of awesome.) The fights between her and Barry and her and Cisco were amazing. Oh, boy, this episode. I'm still shaking with excitement over that ending. At first, I was super irritated with Savitar. How in the multi-verse can he know everything? Every move, every word spoken? How?! But it makes sense now. It all makes sense. And I freaking knew it. When Barry started thinking about how Savitar knows everything, I got chills because I knew what was about to happen. I had this huge feeling a few episodes ago that Savitar was a future version of Barry --someone familiar to Team Flash, dark-haired, male. I actually was starting to think this after Savitar plainly said "I'm the future Flash," but I didn't understand how it could be. I didn't think Barry was a possibility because why would he kill Iris? But this episode confirmed that feeling, and I'm dead. This changes everything for The Flash. I still have questions--such as why Savitar kills Iris, how Barry turned into this monster, and more. But this is brilliant. This episode was insane. There was a lot of action and tension. There was a lot of heartbreaking scenes, and there was the big reveal. Everything from the past season came together for Barry to figure out who Savitar is, and it was fantastic. I'm so excited to see what Team Flash will do now. What did you think of "I Know Who You Are"? How do you feel about Savitar's true identity?